These daikon radish pickles are pretty, delicious, and different. I had an absolutely ginormous daikon radish from the CSA, as you may remember, and needed to use it up ASAP a couple of weeks ago. As I stated, I had been planning on bringing a relish tray along to Thanksgiving, so I thought pickling the radish would be a wise move. I chose this recipe because I guessed – correctly, which is more than I can say for the last constitutional law quiz I took – that the turmeric would impart a lovely yellow color to the radishes that would look pretty next to some pickled beets and dill pickles. They also tasted lovely, with a hint of sweetness and a really interesting umami from the sesame oil. In a small saucepan, heat vinegar, water, sugar, sesame oil, and tumeric over medium-high heat to a boil. Whisk to make sure all sugar is combined. Let cool. Meanwhile, toss radish slices and kosher salt together and let drain in a colander for about an hour. Rinse the daikon. Place daikon in a canning jar and pour cooled sugar and water mixture over. Seal tightly. Refrigerate at least over night before serving. The incredibly generous and awesome people who host Thanksgiving on Zak’s side of the family gave us the turkey carcass to take home with us. I thought fondly of them all day as the gorgeous, golden stock simmered on the stove, wafting it’s savory deliciousness throughout the home. We went out for day-after-Thanksgiving pho, so late in the evening I was trying to decide what to make for dinner. 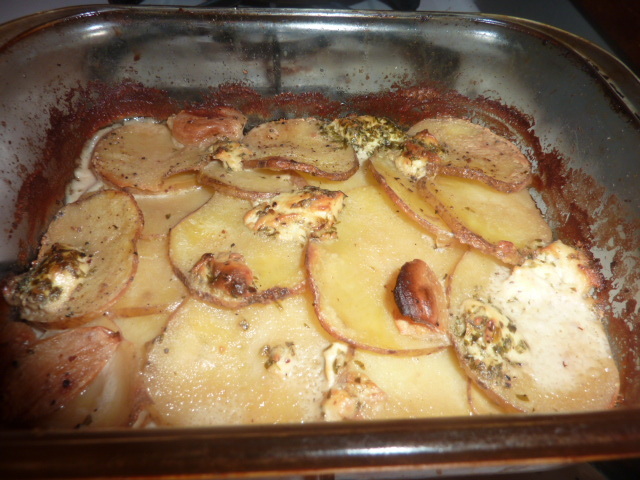 Knowing I had a touch of half and half left in the fridge and some potatoes in the pantry, I settled on some sort of gratin or scalloped potato. Since I was just taking the stock off the stove as I was making this, I decided to give this delicious and decadent side dish a splash of Thanksgiving-y goodness in the form of rich and fragrant turkey stock. The final product here was melt-in-your mouth tender, with a lovely flavor of garlic, turkey, goat cheese. I devoured this all on my own and enjoyed every last savory, creamy bite. If you have some leftover stock, I highly recommend putting this on your after-Thanksgiving list. In a medium saucepan, add half and half, stock, garlic, peppercorns, and potatoes. Over medium heat, bring to a simmer. Simmer 2-3 minutes. Spray a small casserole dish with nonstick cooking spray (or grease with butter). Being sure to discard peppercorns, add a layer of potatoes about half of the potatoes, overlapping edges. Season with kosher salt and freshly cracked black pepper. Add a garlic clove or two and dot with half of butter. Add second half of potatoes in another layer. Season again with kosher salt and freshly cracked black pepper. Add another garlic clove or two and dot with the rest of the butter and the chévre. Pour strained broth and half and half mixture over the potatoes. The liquid should come up to just below the top layer of potatoes. Cook, covered, for about 45 minutes. Uncover and cook another 15-20 minutes until edges of potatoes and cheese are lightly browned. Let sit 5-10 minutes to set up before serving. While pickled beets may not be for everyone, if they are something that you think – even oh-so-slightly – you might be interested in, you should try this recipe. Especially if you have an abundance of beets from your CSA and an itch to use up some pickles in your fridge by making a relish tray (it’s the holidays, after all!). These beet pickles are incredibly easy to make. Just roast some beets, slice them up, boil some stuff, and put it all in a canning jar. 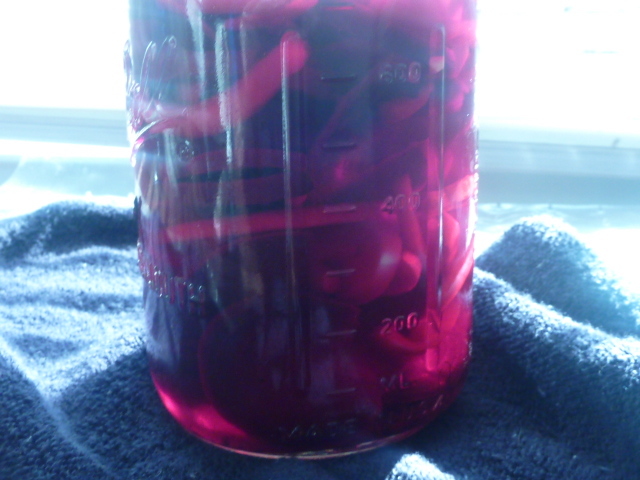 Leave it there for a week or so and you will have really earthy and delicious pickled beets with a kick of vinegar. As a bonus, the onions are also a really delicious treat and are a beautiful burgundy after a few days in the jar with the beets. Arrange beets and onions in layers in a canning jar. Meanwhile, bring remaining ingredients to a boil in a small saucepan. Whisk to make sure sugar is thoroughly dissolved. Pour over beets and tightly close lid. Let refrigerate 3-7 days before serving. 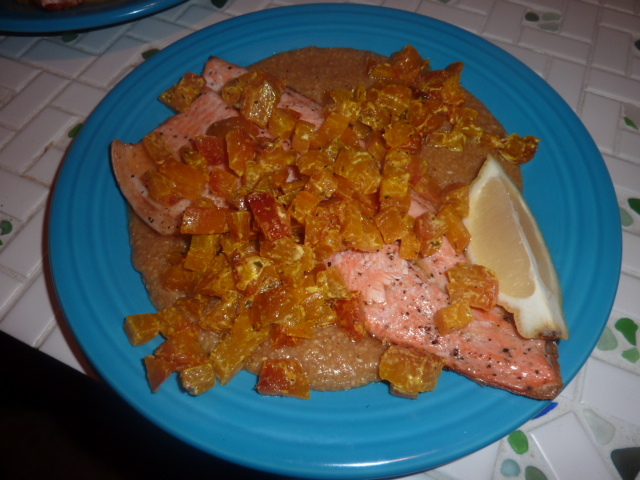 This dish was healthy, easy, and delicious. Zak said this was guaranteed a spot in his top ten favorites for this year. All of the flavors come together really well, from the earthy sweetness of the beets to the tangy bite of the goat cheese. The flesh of the fish is moist and flavorful. This dish is perfect if you are unsure of your seafood skills, because you are pretty much guaranteed a foolproof way to get flaky, melt-in-your mouth tender trout. The beets are also insanely easy, simply requiring you to peel, chop, and toss with some cheese. However, the combination of pretty colors and intense, interesting flavors make this dish seem like it should be a lot of work. In reality, the hardest part is stirring the polenta! Cover a baking sheet that will fit both fish fillets with tinfoil. Brush with olive oil. Rub olive oil on both sides of fish and season liberally with kosher salt and freshly cracked black pepper. Place in oven and roast 18-20 minutes until fish flakes easily with a fork. Internal temperature should be 145°. Trim off both ends of beets. Place on a sheet of tinfoil and drizzle with a tablespoon or two of olive oil. Season with kosher salt and freshly cracked black pepper. Fold up edges of tinfoil and crimp to create a packet. Place in oven and roast forty minutes or until easily pierced with a fork. The cooking time will vary depending on the size of your beets. Open tinfoil packets, carefully to avoid steam. Let cool. 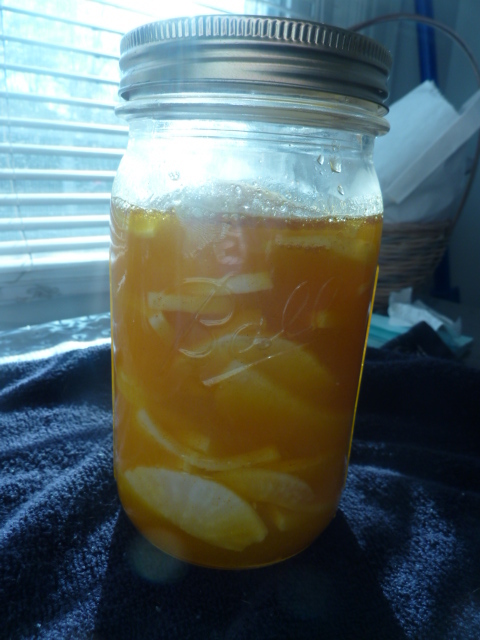 Peel off skins and cut into 1/4″ to 1/2″ cubes. In a medium sauté pan, add remaining olive oil over medium heat. Crumble in chévre, whisking to combine. Add beets and toss to coat. Cook until warmed through. Serve over the fish and polenta. Bring stock to a boil. Whisk in polenta in a thin stream and let come to a vigorous boil. Whisk thoroughly and reduce heat to medium. Simmer, whisking often, about 20 minutes until creamy and cooked through. This dish is both decadent and delicious. The rich browned butter and cream from the half and half create a rich, deep-flavor when combined with the sweet roasted butternut squash. 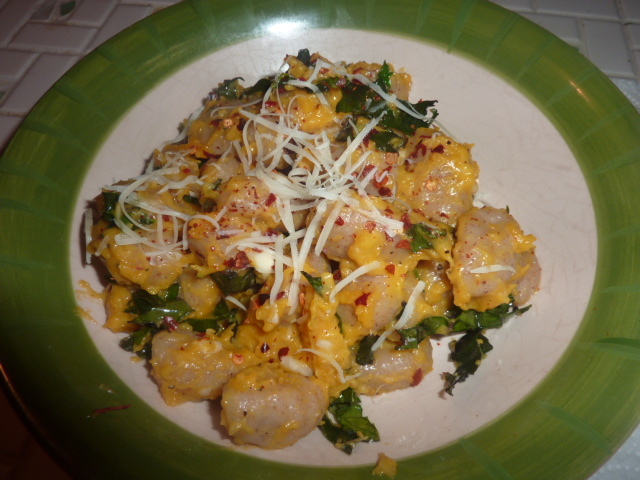 Combined with the slight bitterness of the sautéed kale and pillow-y starch of the gnocchi, this dish is perfection. It is also healthy enough that you don’t have to feel guilty. Whole wheat gnocchi adds a serving of whole wheat and stand up beautifully to the bold flavors of the browned butter and butternut squash. The squash is rich with vitamin A, as is the kale. The kale also has an insane dose of vitamin K. Both also have a really respectable smattering of other vitamins and minerals as well. Even Zak, who isn’t the hugest butternut squash fan, really loved this. This is definitely something I will be bringing out for special occasions in the future and is a must-try for anyone who loves butternut squash, browned butter, kale, or gnocchi. Preheat oven to 375°. Using a sharp knife, cut some slits in the squash. Place on a baking sheet and bake 60-90 minutes until tender. You should be able to easily insert a knife tip deeply into the squash. Let cool until cool enough to handle. Scoop out the flesh, reserving the seeds for another use. Puree the flesh in a food processor or using a hand mixer until smooth. Should yield about 3/4 cup. Season with kosher salt and black pepper and set aside. In a 10″ cast iron skill, melt butter over medium-low heat. Cook until it just begins to froth, and then reduce heat to low. Cook another 2-3 minutes until just beginning to brown. Add garlic and cook until fragrant, about a minute. At this point, the butter should be golden brown. If not, cook another 1-3 minutes over low heat. Add butternut squash puree and half and half and whisk to combine with the butter. Add the kale and stir to combine. Cook until wilted, 2-3 minutes. Add gnocchi and stir to coat with the sauce.